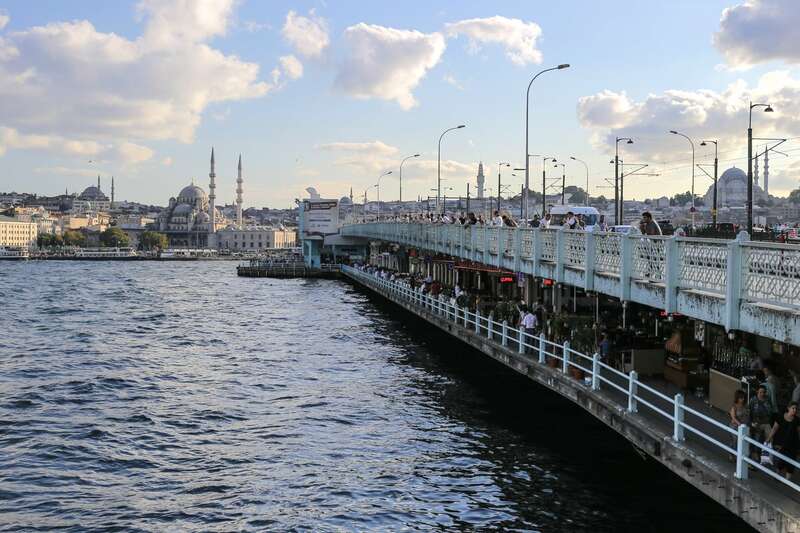 After a full day of seeing the Old City’s sights, we traverse the Galata Bridge (part-bridge, part-shopping center) across the Golden Horn to the northern portion of the European side of Istanbul. 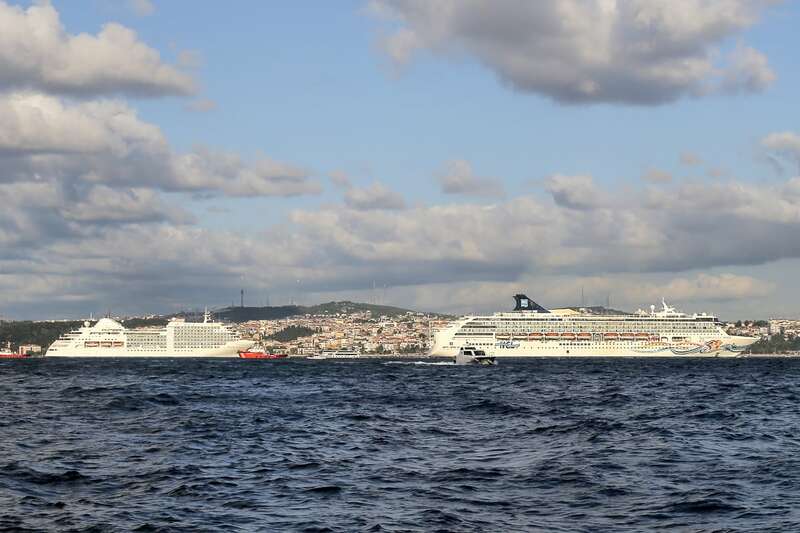 I’ve mentioned previously that Istanbul has a population of around 14 million people, and covering some 2,000 square miles there’s no disputing that today’s Istanbul is one of the world’s great megacities. This fact didn’t quite sink in until we’d spent a few exhausting days exploring Sultanahment (the heart of the Old City) before looking at a map and realizing that we had seen only the tiniest of fractions of this enormous city that spans two continents and two seas. 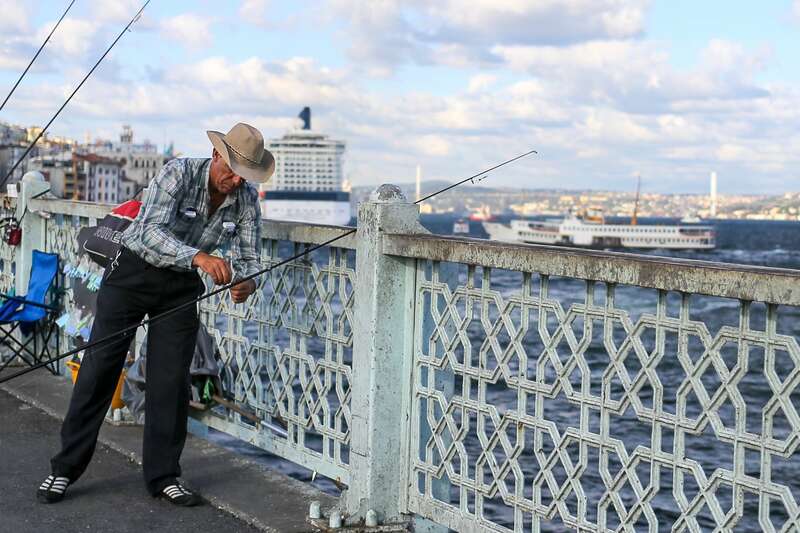 So, we crossed the Galata Bridge, teeming with fishermen and folks out strolling, evoking a much smaller European town. 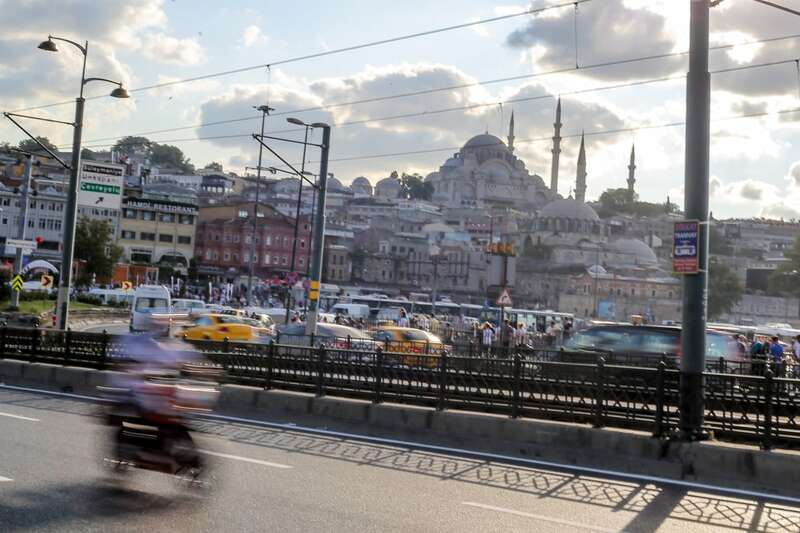 Spend your entire time in and around Sultanahmet and it may not seem like more than a few thousand people live in this city. 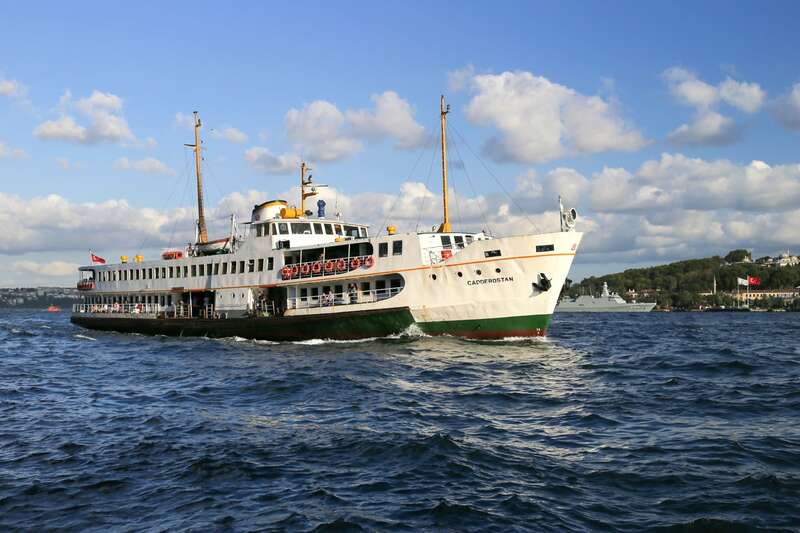 Galata is a great place to watch fishermen bring in the daily catch and watch the ferries and mammoth cruise ships come and go. 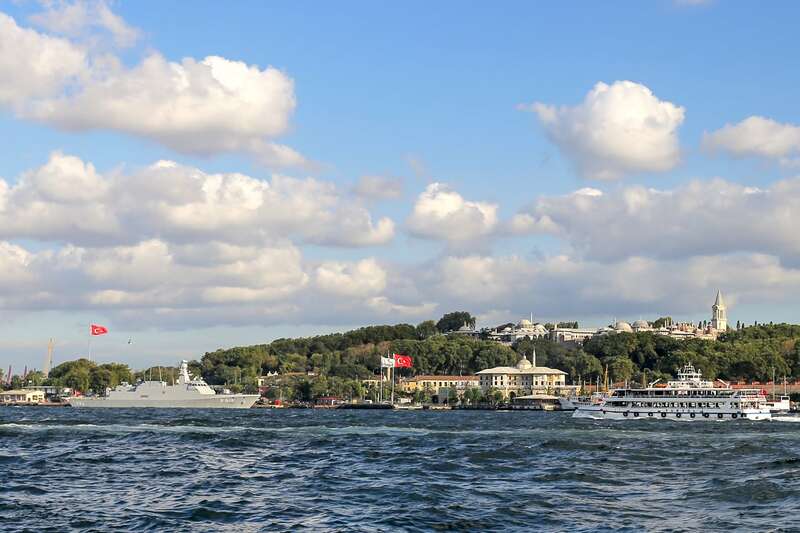 From Galata, Topkapi Palace is viewed across the water, perched high atop the Sultanahmet neighborhood. 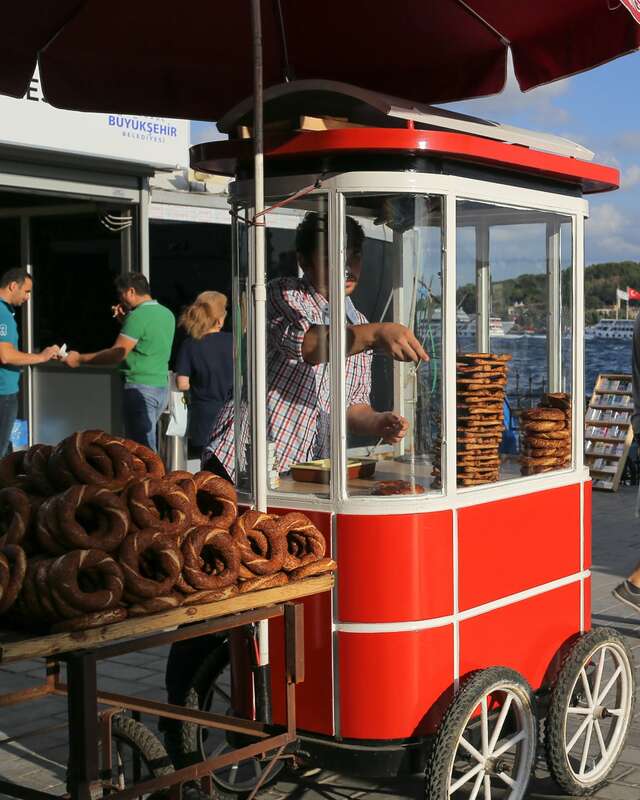 It’s also a great place to sit by the sea with a Turkish treat and enjoy the sea breeze on a beautiful late summer’s day. 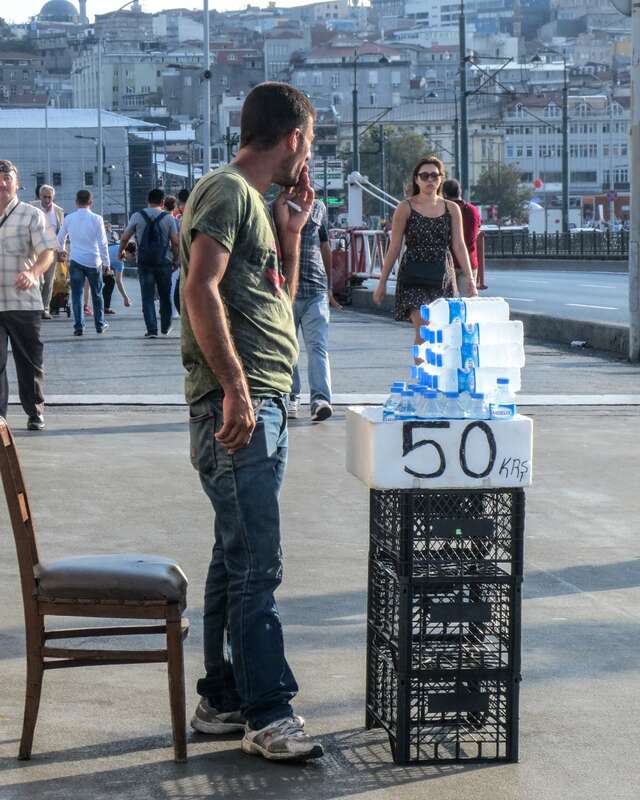 We saw a group of locals sitting on plastic stools along the water drinking tea and thought we should do the same. I mean, who can pass up a seat with an incredible view and drinks for US $1.85! 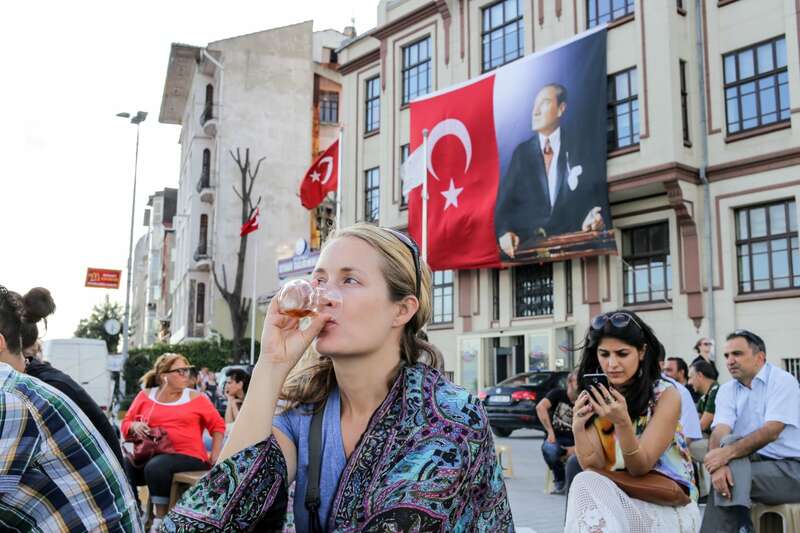 Sipping tea by the sea under the loving gaze of Atatürk. 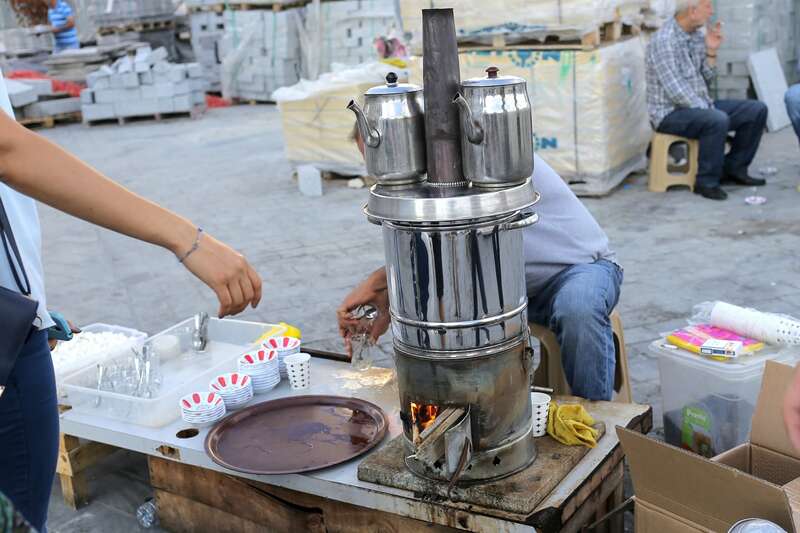 The tea operation in action. 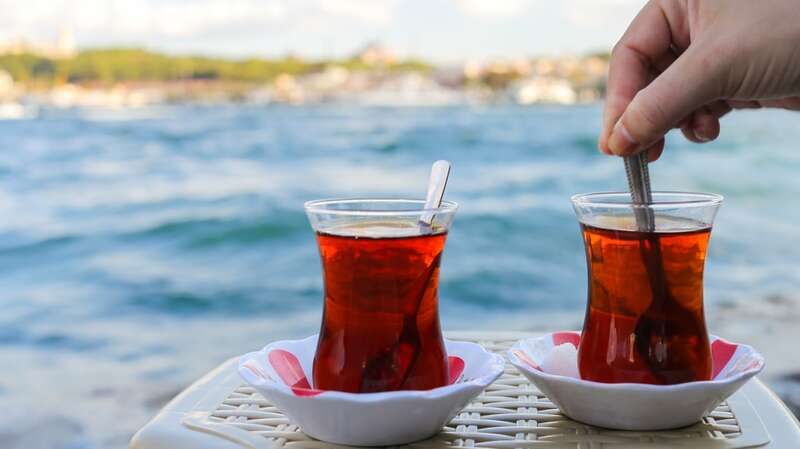 Caffeinated to the gills after a day’s worth of sipping tea and coffee, we head up to conquer the mighty Galata Tower for sunset. 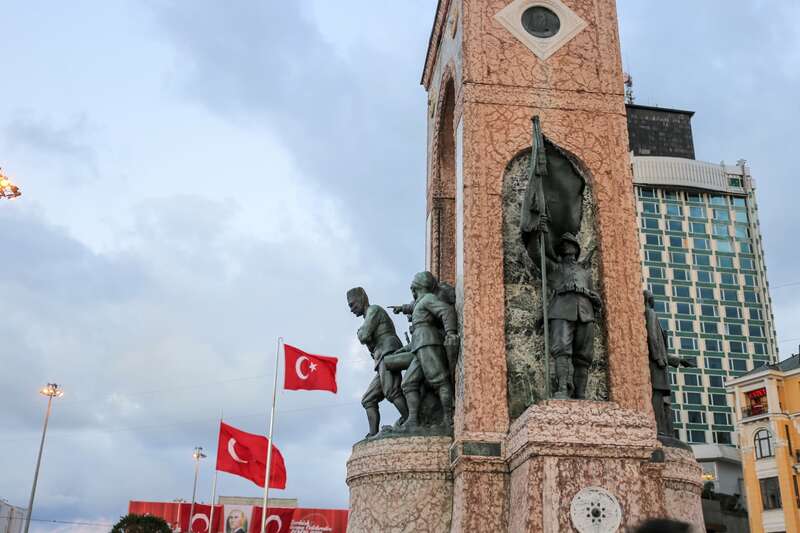 Unfortunately, the line was ridiculous (it was a gorgeous evening, after all), so we moved on to conquer Taksim Square. 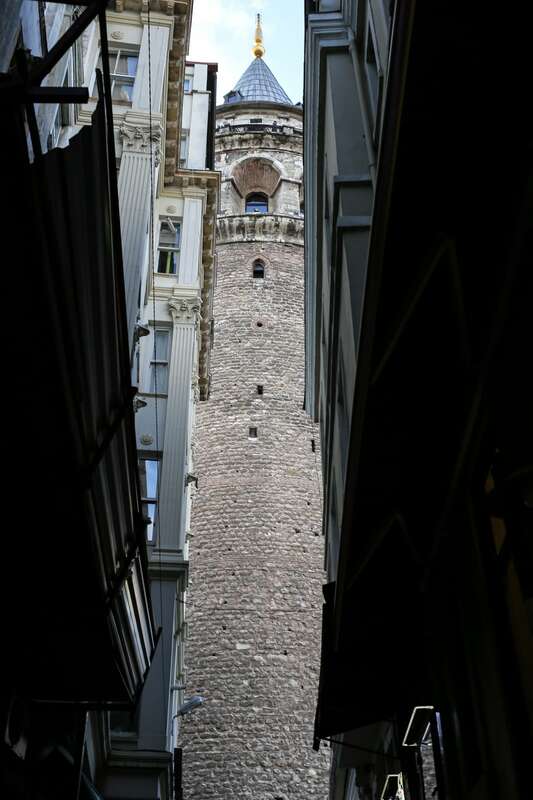 We were also caught off guard on the walk up to the Galata tower, through Galata’s narrow and winding alleyways, how hippie-alterna-punk the area was. It felt like we were walking around on the fringes of a major university’s campus, particularly Eugene or Berkeley as the number of piercings, tats, ganja smoking and dreadlocks evoked. But, unless my map app (and every other map we had) is in severe need of updating, the nearest university is across the water in Fatih, quite a few miles from where we were now. Nonetheless, the area just has that bohemian, up-and-coming vibe with more coffee shops, tatoo parlors and vegetarian eateries than you can shake a doobie at. 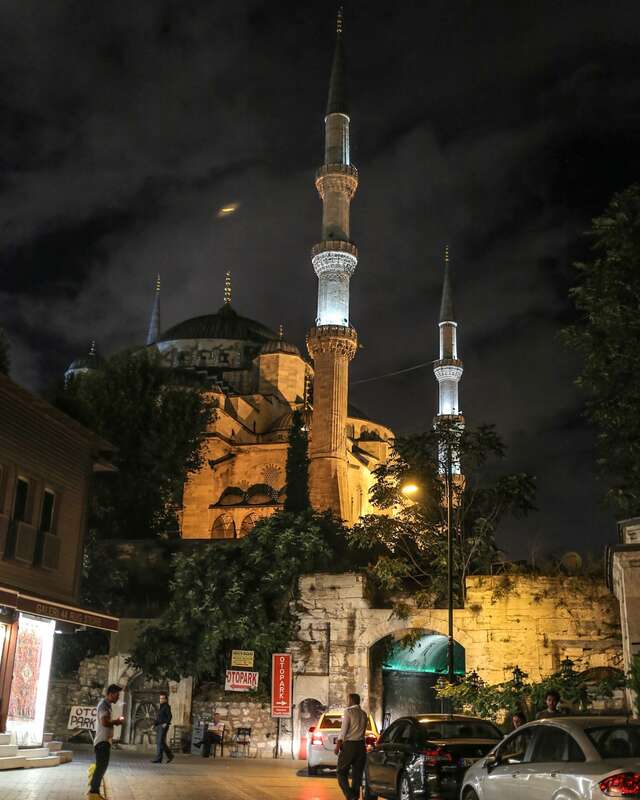 As I mentioned before, if you were to spend your days in the Old City, you’d have a very narrow perspective of Istanbul (and Turkey, as well). 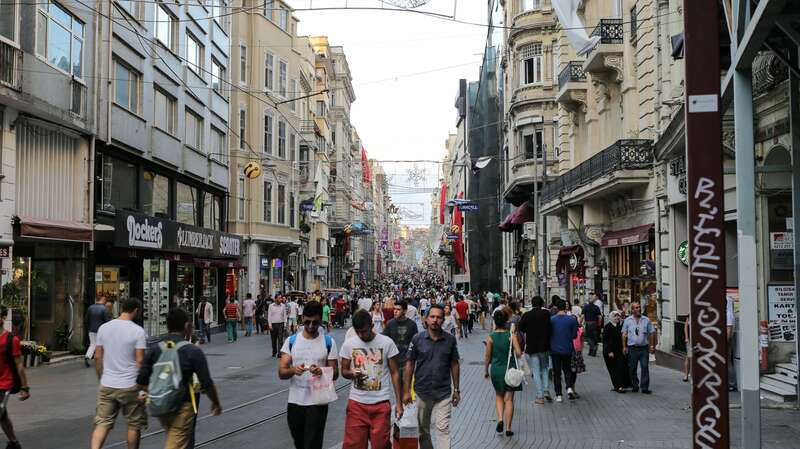 But head up Istanbul’s main modern commercial promenade, Istiklal Caddesi (Istiklal Avenue) from Galata Tower to Taksim Square, and it quickly becomes apparent how 1) modern, 2) trendy, 3) young and 4) populous this city actually is. 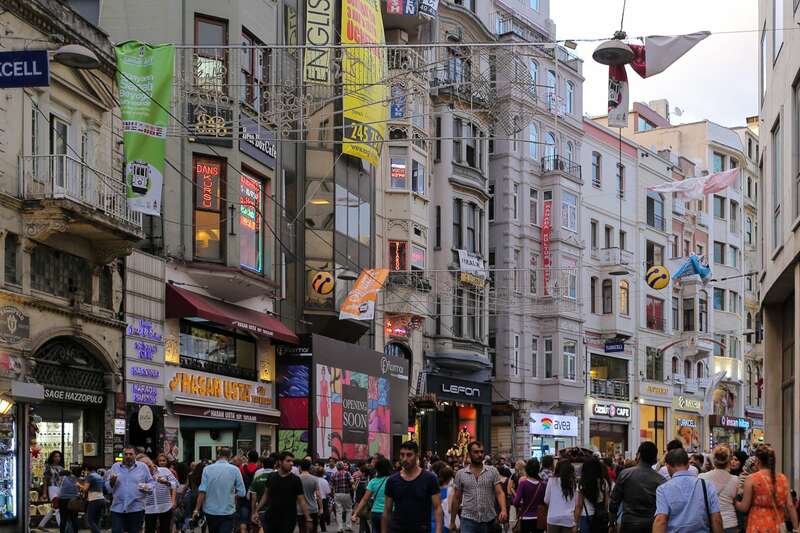 Turkey, overall, is a young country in terms of demographics: A quarter of the population is under the age of 14, and the median age is around 29 years old. 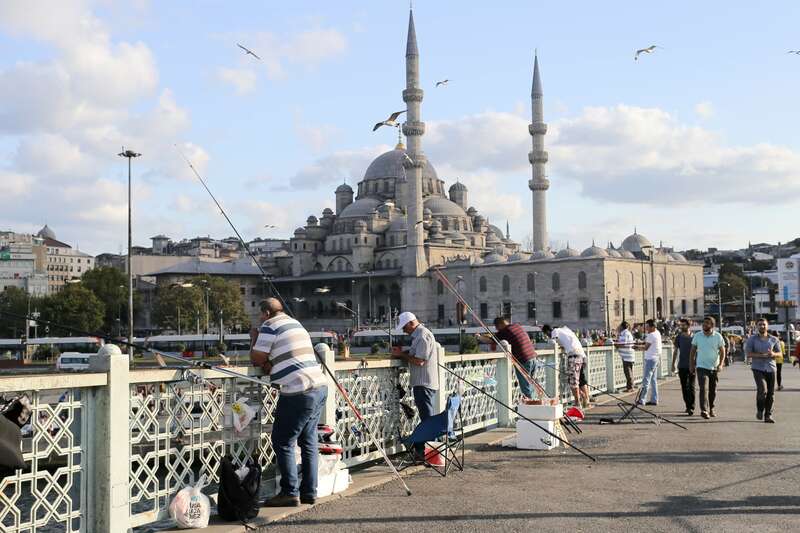 It’s also an urban country, with over 71% of the population living in urban areas, with people moving from rural to urban centers at twice the rate of the U.S. Again, spend your days in Sultanahmet and this all would seem ludicrous, but take a jaunt across the Galata bridge and up the road and it’s a whole other world. Welcome to today’s Turkey. 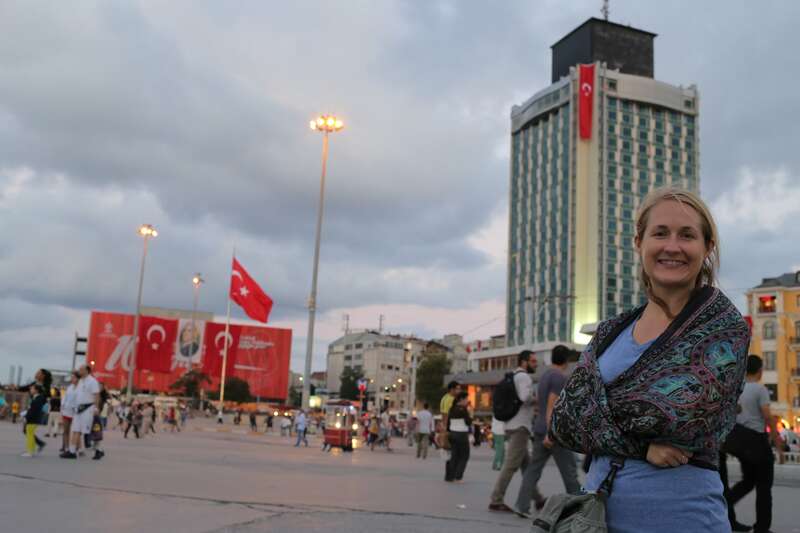 After a nice, long stroll, dodging Istanbul’s Versace set and rest of the beautiful people, we make it to Taksim Square! Admittedly, after all the headline news, we expected to see a smattering of holdouts, small pockets of resistance voicing their peaceful dissent, but nope, not this Friday night. 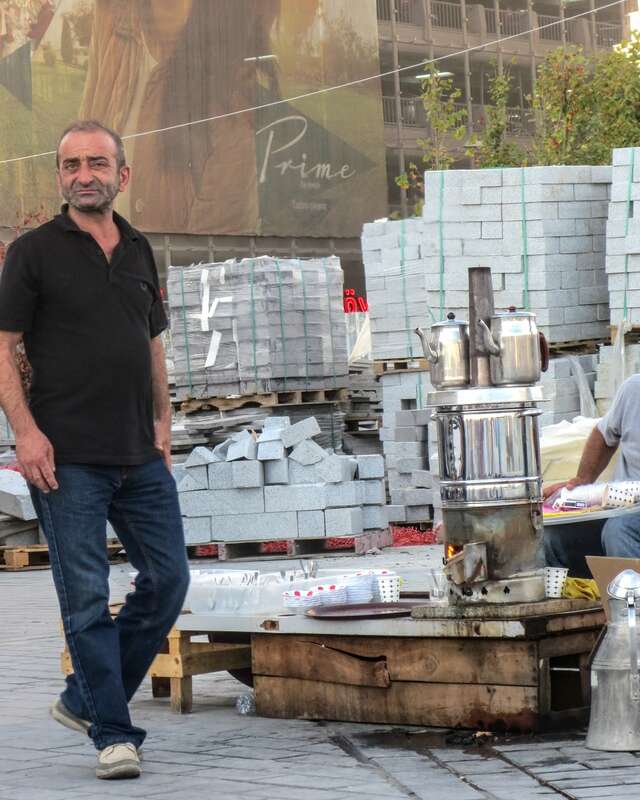 Perhaps they were too busy perusing the latest fashions on Istiklal or getting another tat in Galata. Who knows. Despite the U.S. media throwing Turkey into the pile with other “Arab Spring” nations such as Egypt, Libya, Tunisia, etc., Turkey is none of these. Yes, Turkey’s got major institutional challenges (like anywhere, these days), and yes, Turkey’s growing youth demographic will be giving the conservative Turkish establishment a run for their money in good time (provided that they can stave off the powerful opiate of iGadgets and American-style consumerism, which is a big ‘if’). But one can’t help but feel a similar sense of awe, excitement and inspiration — like being in Shanghai or Ho Chi Minh — that something’s definitely happening here…and what it is ain’t exactly clear. What is clear, however, is that these megacities full of youth and optimism will be leading the rest of us in 20-50 years, while the U.S. continues to struggle to figure out how to maintain the status quo. 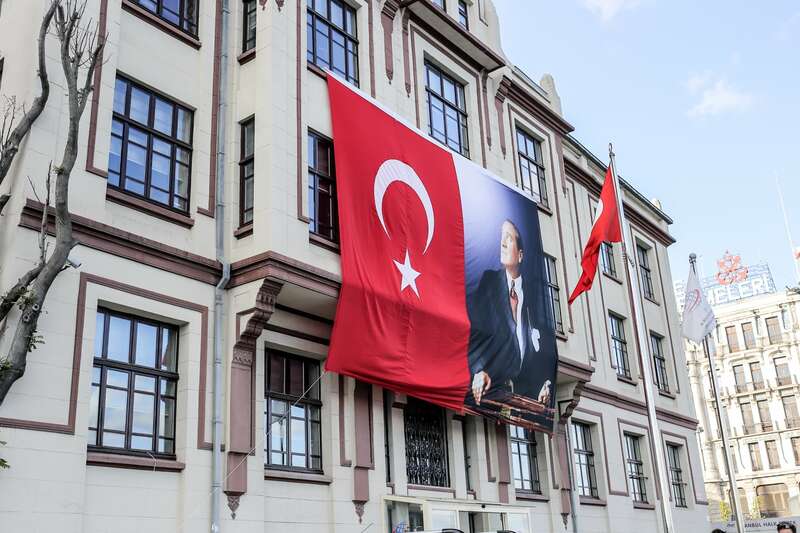 But it’s not clear yet what that Turkey will look like a generation from now, as the entire country (like the rest of the region) is being pulled in two diametrically opposed directions, roughly following traditional/religious/conservative lines and progressive/secular lines. 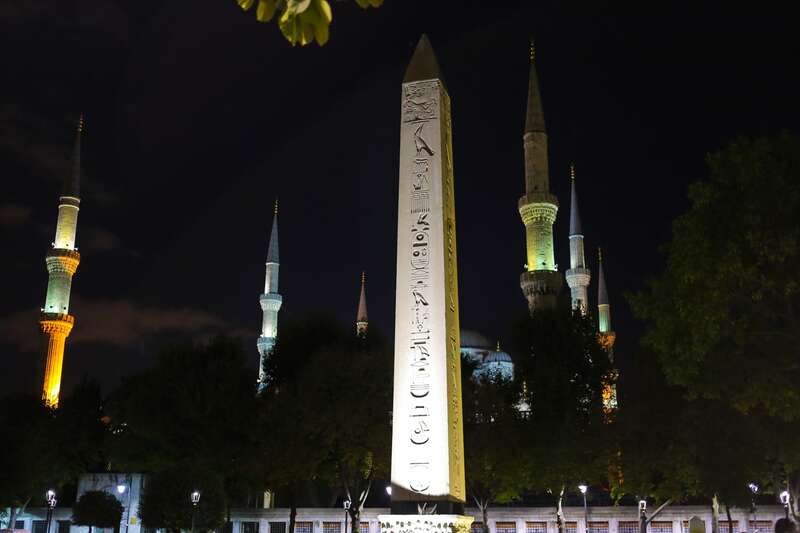 Back in Sultanahmet, taking an evening stroll back to our guesthouse, we pass reminders of the new (young families and children playing in the square) superimposed over powerful reminders of the old ways. One last thing… lamb meatballs and Rakki at Albura Kathisma! Highly recommended. 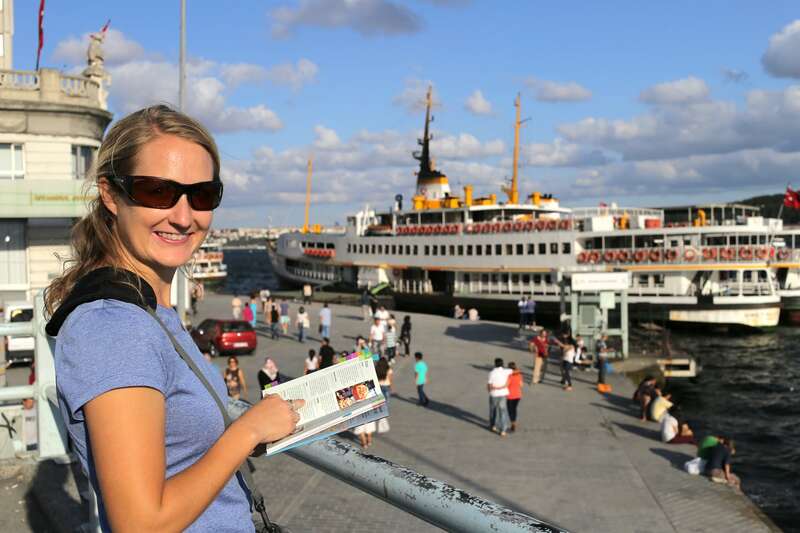 You captured the essence of Istanbul & Turkey exactly! Love the pics! As always enjoyed the journey and it brought back great memories, thanks! Great presentation!!! 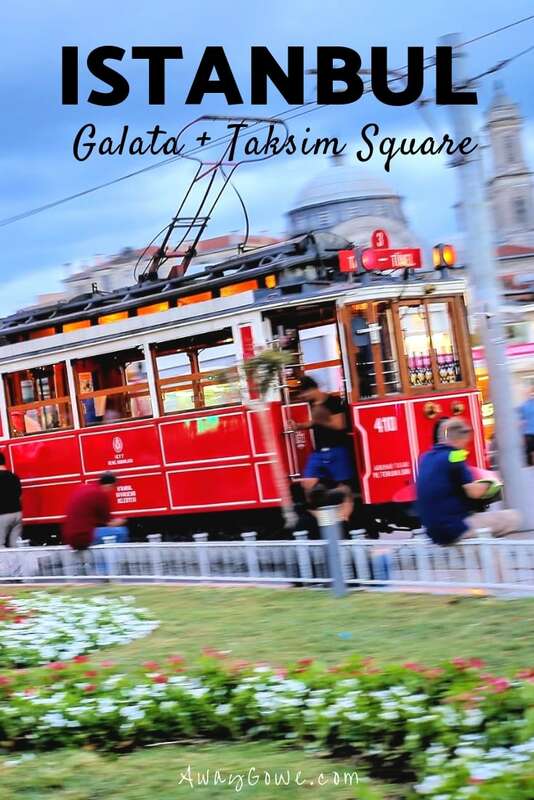 Its cool that you guys got to experience parts of the old and new Istanbul…what a mind blowing city….14 million people and you and Lori were still able to eat, sleep, navigate & explore without a hitch…You are super tour guides in my eyes! 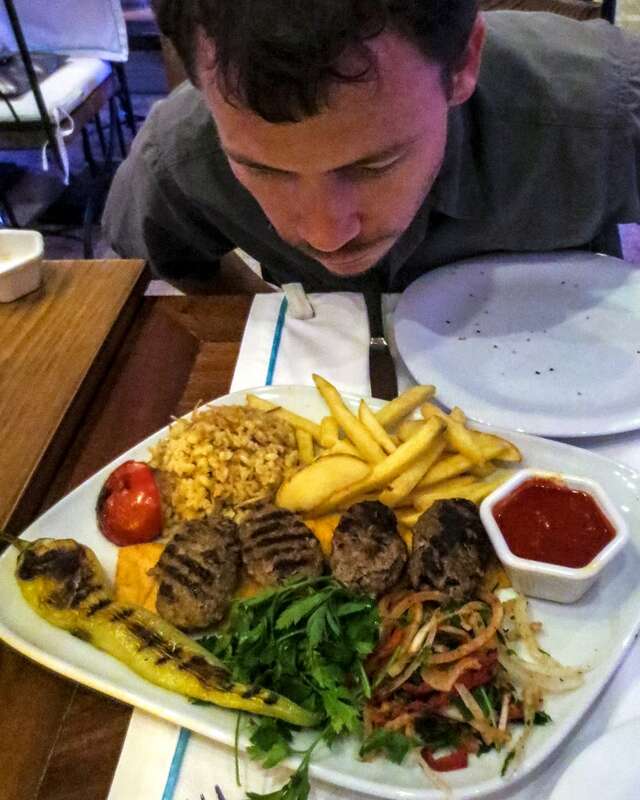 btw how’s the beer in Turkey? 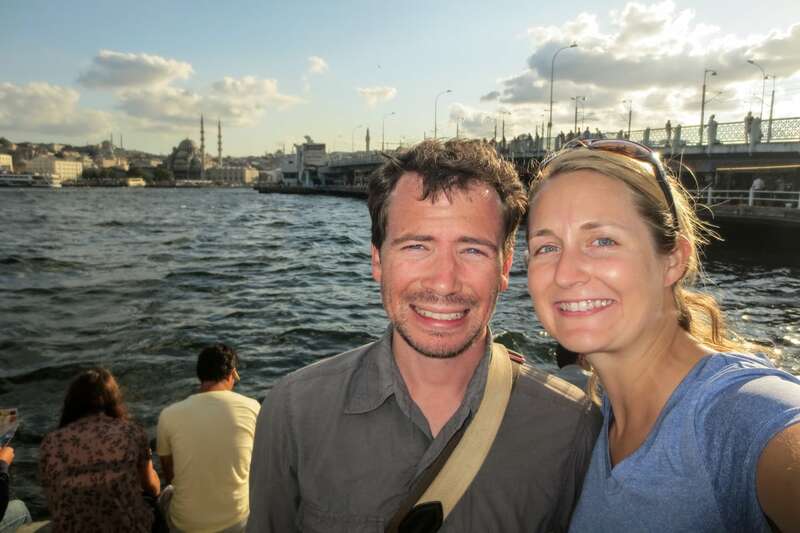 It’s cool that you guys got to experience parts of the old and new Istanbul…what a mind blowing city…14 million people and you and Lori were still able to eat, sleep, navigate & explore without a hitch. You are super tour guides in my eyes! btw how’s the beer in Turkey?